It is football season in Bhutan. 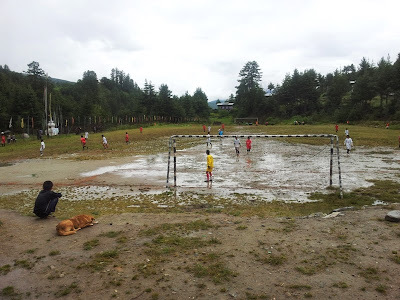 To clarify, it is football as in the ‘world game’ soccer. 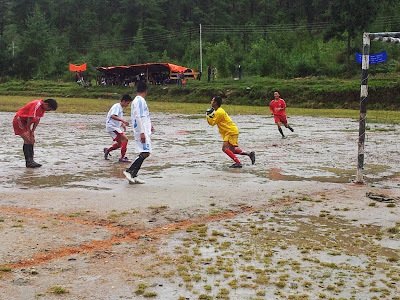 This weekend, the King’s Cup was concluded at Changlimithang in Thimphu with Nepali team Manang Marsyangdi edging out local team Yeedzin for the winner's trophy. (fellow Aussie BCF teacher) blog if you want to get the lowdown on football in Bhutan. 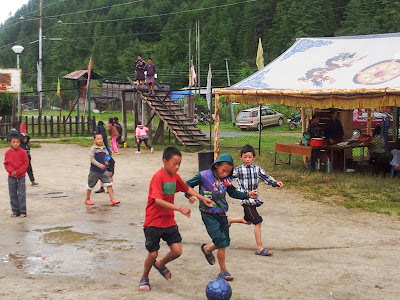 Football in Bhutan seems to predominantly be a men’s game while women take a supporting role, so if you choose to read further you’ll find out more about what we ate than how many goals were scored by which team! 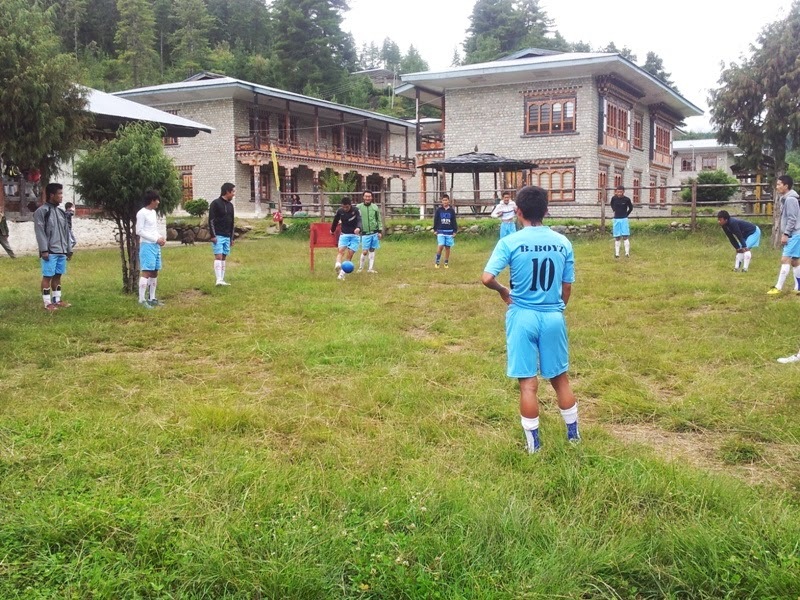 Chumey MSS is hosting the regional Monsoon Football tournament for the next three weeks, and Saturday afternoon was the first kick-off. As soon as Saturday morning lessons finished, I joined the other ladies in one of the science labs to help cook up a storm. 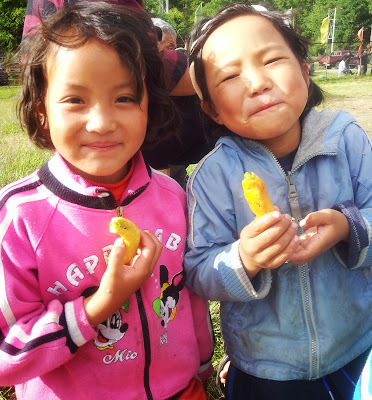 The snacks we made are to sell to the audience and participants and raise money. The school has embarked upon an ambitious project of building 12 religious statues for the school hall with an estimated cost of about $14000. That is an enormous amount of money anywhere in the world, and it is eye-opening to say the least that the priority of the school is to fund statues while I see so much educational need, but in Bhutan obviously priorities are vastly different. So I wonder how far the proceeds of all the snacks we’re making will go? 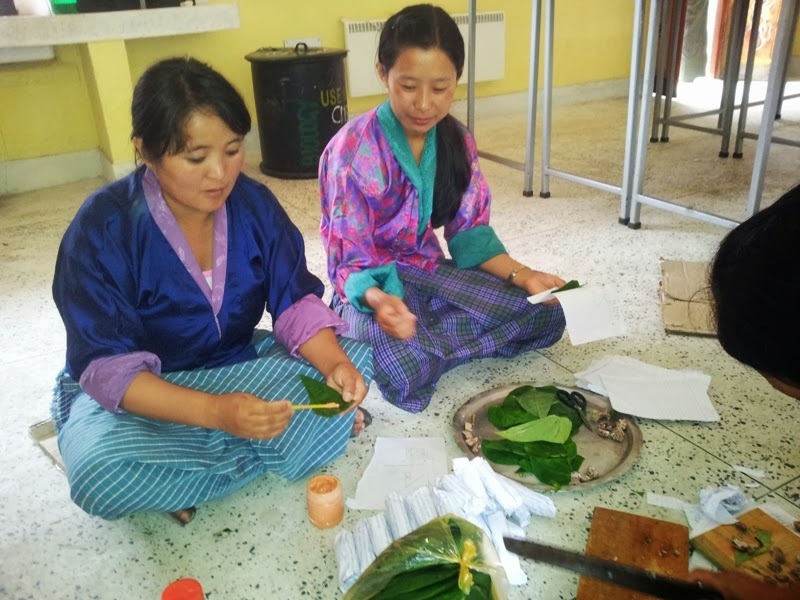 If you know me, you know I love cooking and food, and so I really relished the opportunity to get involved in learning to cook all the Bhutanese favourite snacks. 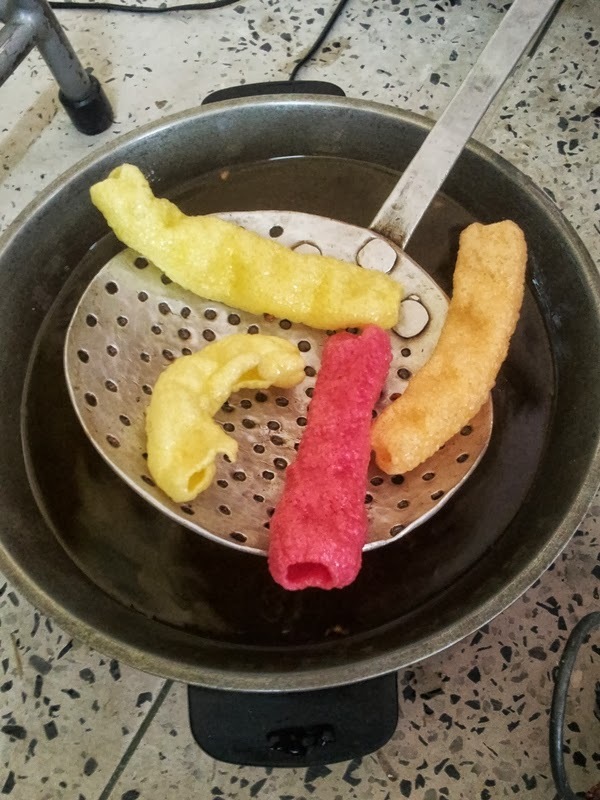 On the menu were: chilli chop (battered deep fried chillies), aloo chop (mashed spiced potato battered and fried), vegetable momos (steamed vegetable dumplings) finger chips (deep fried coloured ‘noodles’ that are crispy and moorish, a bit like prawn crackers) and ezay (chilli salsa). 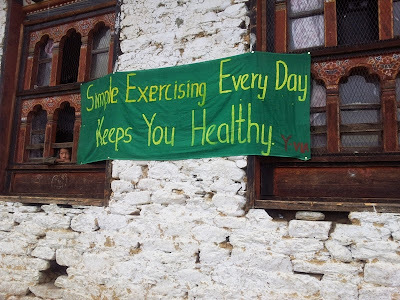 And no social function in Bhutan would be without doma (betel nut)! My first role was to help with packaging up the doma. 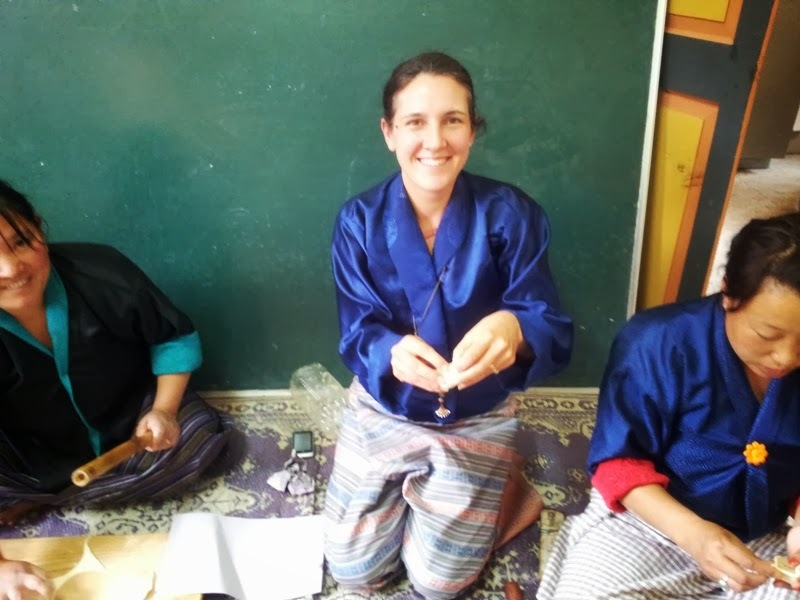 Doma is a curiosity to me – I’m not interested to try it as you end up with a mouth of crushed betel nut and dripping with red saliva, and yet it must have a strong appeal as most adults here chew doma throughout the day (even while teaching!) and even children take it too they tell me! Preparing the doma - chopping the nuts. So we rolled four leaves smeared with lime paste with four pieces of betel nut in a piece of recycled note paper (watch out students – if you leave your note books lying around they will be put to good use!). They sell for 10 ngultrums (20c) and as part of social life here, everyone seems to have a little packet of doma hidden in their kira or gho, ready to share around. 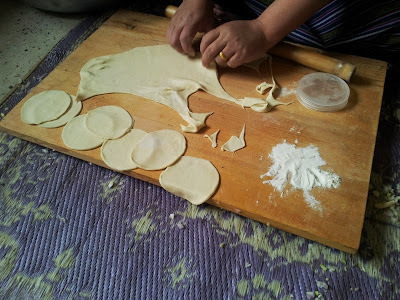 Next I joined the momo making production line. 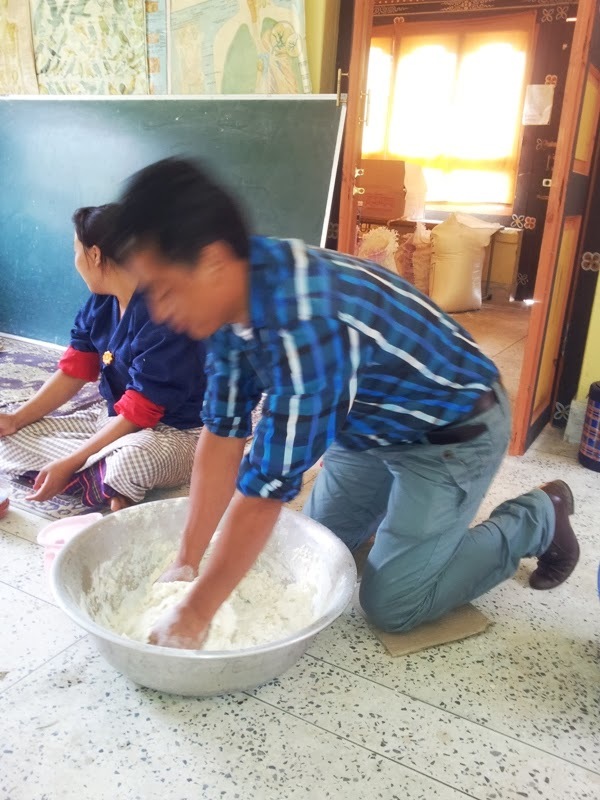 Already one of the teacher’s husbands had come in to lend his elbow grease to the task of mixing and kneading the dough. I was told the dough is just plain flour and water, and it was kneaded to a soft, pliable consistency and left to rest while the filling was prepared. Making the circles of dough for the momos. It should look just like this! The filling was made from chopped cabbage, onion, ginger, salt and ‘tasting powder’ which I found out was MSG. Some mashed potato was added and then quite a lot of vegetable oil which created a very wet mix. Earlier this week I watched the lady in our ‘aloo chop shop’ make momos and she added garlic, coriander and processed cheese to her mix. The mix was stirred carefully by hand until all the ingredients were amalgamated. Miss Rajini showed me once how she folds momos and that was my initiation into the big new world of momo making! 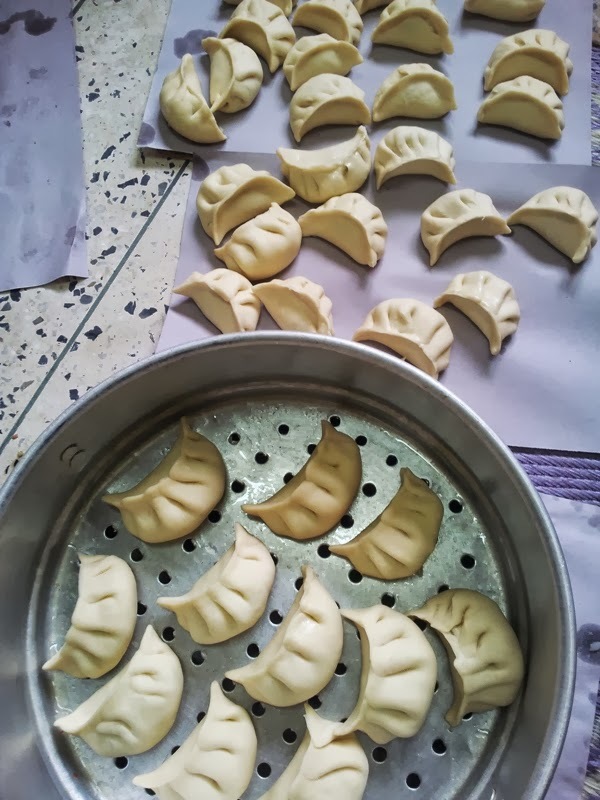 It is true that I dabbled in momo making at home for our goodbye party, and Miss Rajini’s style was similar to what I learned watching youtube, so I was on my way! The dough was so soft and supple to use, and rolled relatively thickly too, not wafer thin like the gowgee wrappers I had used to make momos at home which are quite hard from refrigeration. 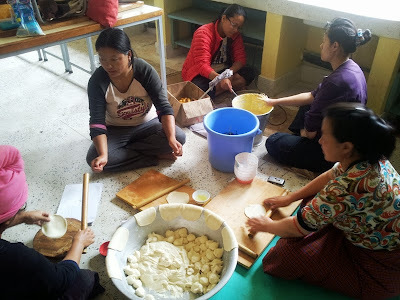 I’d say it was 100 times easier to make momos with the home made dough as they were larger, softer and thicker. Well worth the effort to make. 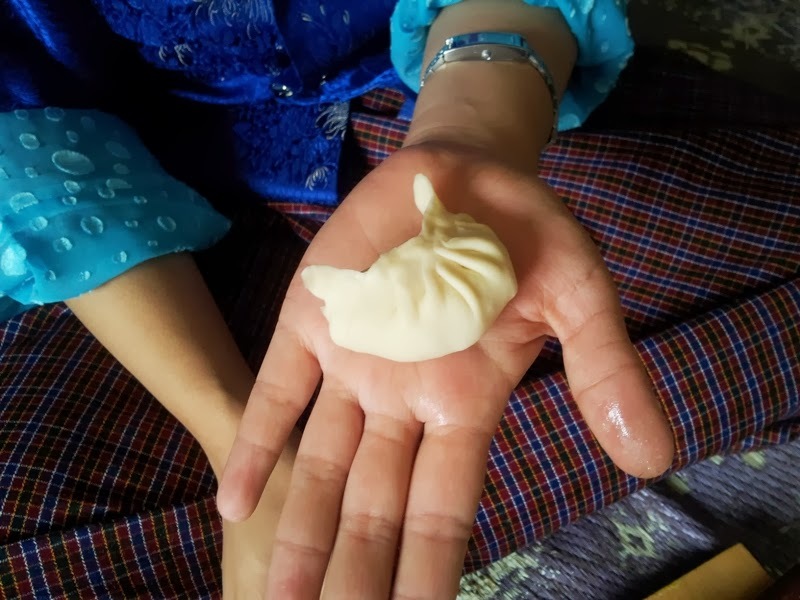 It was fascinating to see that all the women who folded momos had a different technique, and their momos ended up looking quite different. Some were crescent shape, some pleated on the top to make an oval shape. 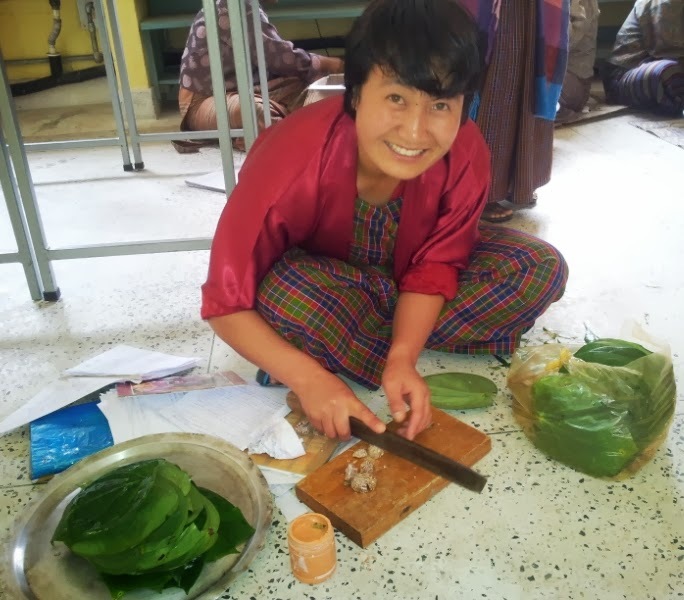 It’s a funny thing to sit cross legged on the floor, dressed in a fine kira to get into the messy work of cooking, but I really enjoyed myself! 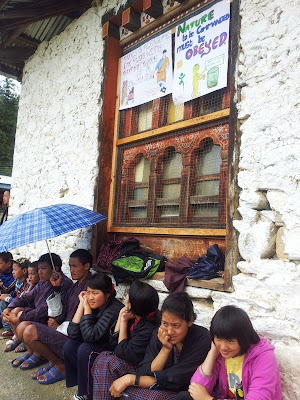 Conversation flowed around me in Dzongkha. If I tuned in I could understand some of what was said and I pounced on any English word in a sentence to make meaning. A very friendly, communal way of cooking. As a group of about six of us made momos – three rolling the dough and cutting it into circles and three filling them, another group of hard workers were onto the task of making chilli chop. 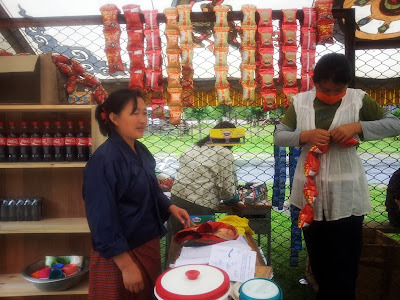 These are a favourite snack food here and cost 10 ngultrums (20c) for three. Half a large chilli, which is medium hot, is dipped in a batter made from mostly besan (chickpea) flour mixed with some plain flour, baking powder, salt and water. It is then dropped in hot oil and deep fried til golden brown and a bit puffy. 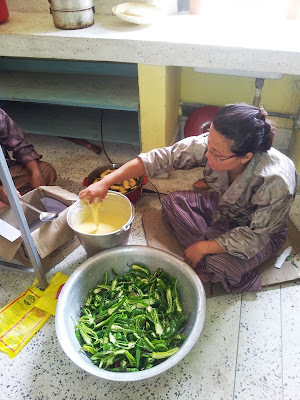 The ladies had a large bucket of chillies and it took them literally hours to batter and fry them all. The makings of chilli chop. Meanwhile another group were working on aloo chop. An enormous pot of unpeeled potatoes were boiled til well cooked and then when cooled somewhat their skins were peeled off. 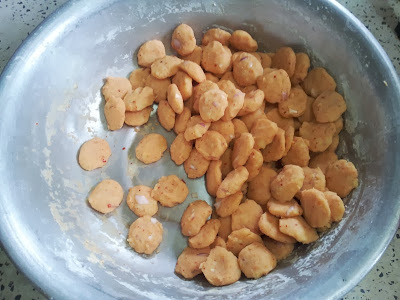 These were mashed and red chilli powder added along with salt, chopped onions and that magical ‘tasting powder’. I was told that chopped coriander leaves are a nice addition if available. These were then formed into flat rounds about 5 cm in diameter and 1cm thick. Sliced onion is added to the mashed potato. We made hundreds and hundreds of aloo chop! These too were dipped in the besan flour mix and deep fried and looked delicious, quite like a potato scallop that we enjoy in Australia. 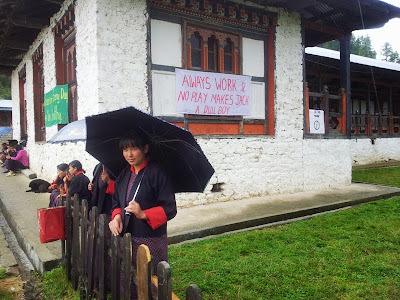 The condiment for all these treats is ezay, and the one made today is the same that is usually served with momos here and is different to the recipe we learned in Thimphu and that I posted here. 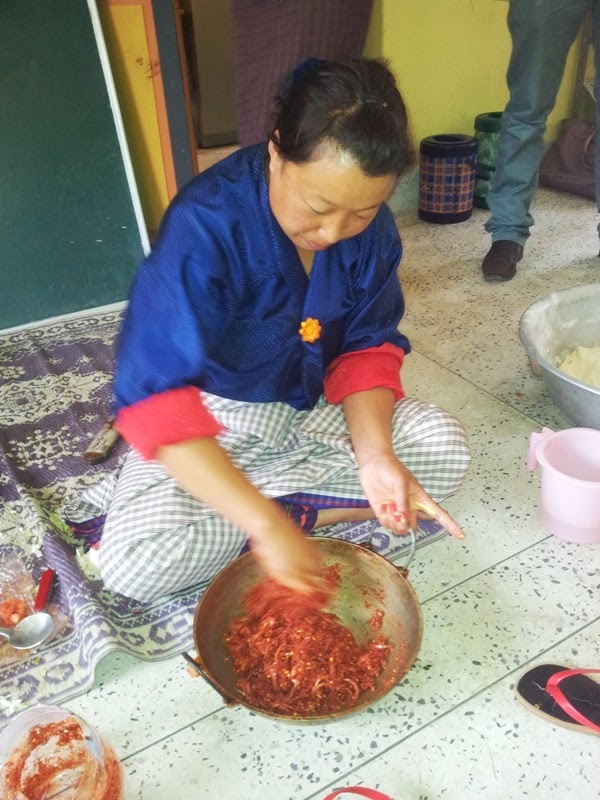 This time a very large quantity of red chilli powder was mixed with chopped tomato, sliced onion, salt, water and ‘tasting powder’ (I had no idea we were eating so much MSG in Bhutan?!). To this, hot cooking oil was added to give it something special and it was mixed very bravely by hand (please do not touch your eyes after doing this!). You can see I’ve managed to write a lot without even mentioning the actual game of football! Finally I had a chance to go and check out the action. While the Chumey MSS boys played against boys from the nearby Vocational Training Institute, my young students were having a makeshift game on the puddly ‘basketball’ court. They don’t call it monsoon football for nothing. The main field was a mud bath and I suspect that this is just the beginning – by the end of three weeks of daily games it will just be slush! Shop set up to sell all our goodies. The boys seemed to be enjoying all the food more than the football! 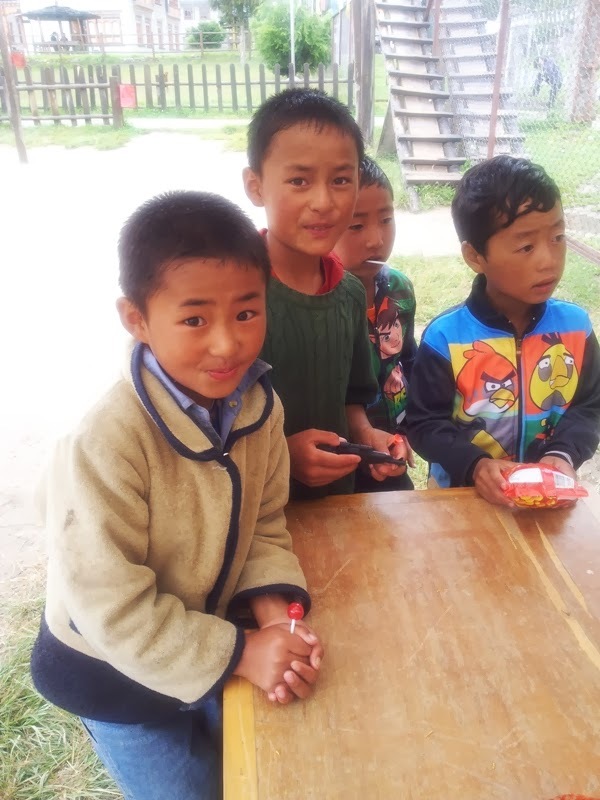 The little school boys had their own game. 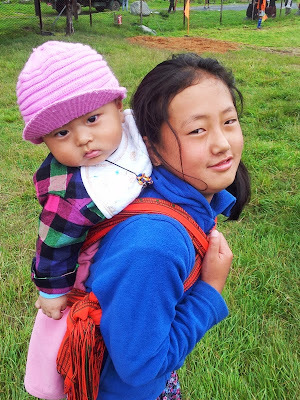 Karma's little brother looked so cute, although she wasn't enjoying the responsibility of carrying him round! I've been requested to help everyday with catering, and at some point I'm sure I'll sit down and actually watch a game! I am an Australian mum and school teacher and am spending 2013 with my husband and two little boys living in Bhutan. I look forward to share the experience with our family and friends - both my own observations of home and school life, but also Bhutan through our children's eyes. Puta Lotta Love in your Buckwheat Noodles! 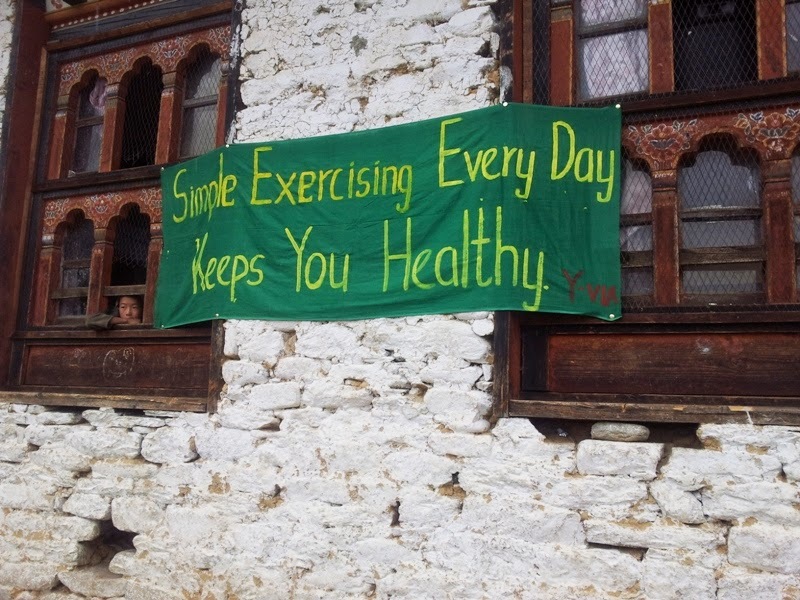 Have you settled in yet?